Riding the wave of critical adoration for 1960’s THE APARTMENT all the way to Oscar glory, director Billy Wilder entered the decade at the utmost peak of his powers as a filmmaker. The film’s success would rightly become the capstone to a career that was emblematic of the Golden Age of Hollywood, but unfortunately for Wilder, the shimmering era of the glamorous silver screen was coming to an end. An emergent generation of auteurs, born under the aura of flickering projector lights and the first to be bred with a formal education in the trade, were poking and prodding at the boundaries of content and style in a bid to make the medium their own. For many masters of the monochromatic era– Wilder included– this would signal a long, inevitable period of decline. Wilder would continue with a string of fairly successful films for the next twenty years, but none would rival the cultural staying power of THE APARTMENT, or even SOME LIKE IT HOT (1959). Indeed, the pop footprint of many of these late-career works is so small today that one can would have substantial difficulty finding most of them on home video. Their relative obscurity is something of a tragedy, especially in our current content-saturated age where supposedly “anything” is available on demand. Wilder’s follow-up to THE APARTMENT would constitute the first work of his twilight era– a perfectly enjoyable film that still failed to connect with audiences despite his best efforts. Titled ONE, TWO, THREE (1961), the film derives its story from a 1929 Hungarian play as well as a 1939 film co-written by Wilder called NINOTCHKA (1). Wilder and his late-career writing partner I.A.L. Diamond update the story to a contemporary Berlin that, as is explained to us in the now-requisite opening voiceover, has been torn asunder as competing political interests and economic philosophies struggle to fill the power vacuum left behind by the collapse of the Nazi regime. Gangster-genre icon James Cagney plays the ambitious motormouth CR MacNamara, a soft drink executive with a leadership style so authoritarian that his underlings (and his own wife) jokingly refer to him as “Mein Fuhrer”. He’s Coca-Cola’s man on the ground in Berlin, tasked with overseeing the region’s market and actively inflating the influence of American capitalism in West Germany. MacNamara, however, is unhappy– he’s got his eyes on a bigger prize: a cushy life in London as the head of Coca-Cola’s entire European operation. His family life isn’t too great either; the constant sarcasm and patronization from his wife Phyllis (played brilliantly by Arlene Francis) has driven him into the arms of his young secretary. An opportunity for change finally presents itself when he receives a call from his boss back in Atlanta, Mr. Hazeltine, asking him to house his teenage daughter Scarlett while she’s on vacation. MacNamara reluctantly accepts, but is utterly prepared for the Scarlett Hazeltine that eventually arrives in Berlin. Played by Pamela Tiffin as a sexually voracious riff on her namesake from GONE WITH THE WIND, Scarlett’s bubbly Southern charms are more than MacNamara could ever contain. She proves impulsive and rebellious, frequently sneaking out of his house at night to sneak over the border into East Germany. One morning she comes back with a new acquisition: a husband. The groom is Otto Ludwig Piffil (Horst Bucholz), a hotheaded and tempestuous socialist and activist who never wastes an opportunity to extoll the virtues of Communism while denouncing the capitalist pigs of the West. Understandably, this is not an ideal situation for MacNamara, and it quickly spirals even further out of control when Scarlett’s father announces he’s going to be visiting West Germany himself in a few days. As the story unfolds in manic, careening fashion, MacNamara must scramble to make this situation right in the eyes of her father, even if it means having to traverse the iconic Brandenburg Gate– that tenuous, razor-thin border between the boundless prosperity of the West and the hard-fought austerity of the East. In this sense, ONE, TWO, THREE is a fascinating reflection of a major historical event as it was unfolding in real time, and these current events caused no shortage of headaches for Wilder, Diamond, and their fellow producer Doane Harrison. The Berlin Wall actually went up along the Brandenburg Gate while they were shooting– the crew literally woke up one morning to find the wall had been constructed overnight right through the middle of their set, and thus had to relocate to Munich and build a replica of the gate’s lower portion. Cagney in particular had such a negative experience on the shoot that he would retire from acting altogether for the next twenty years. ONE, TWO, THREE’s cinematographer Daniel L. Fapp would be nominated for an Oscar for his first and only collaboration with Wilder. The visual aesthetic is similar to Wilder’s efforts on THE APARTMENT, presented in Cinemascope on black and white 35mm film. Owing to Wilder’s long-standing prioritization of dialogue and performance over cinematography, ONE, TWO, THREE is a strictly no-frills affair. Wilder often packs multiple characters into a single frame so as to emphasize physical comedy and interaction, necessitating a presentation that favors deep focus, wide compositions, and classical camera movement instead of cuts. Wilder does allow himself a few expressionistic flourishes, however– scenes set in MacNamara’s office often are framed looking down rows of desks in one point perspective, much like Wilder had done to higher-profile effect in THE APARTMENT. He also supplements Andre Previn’s jaunty score with the pointed inclusion of classical source music like Wagner’s “Ride Of The Valkyries” or Aram Khachaturian’s “Sabre Dance” in a bid to heighten the mayhem. ONE, TWO, THREE is loaded with Wilder’s signature sharp wit and clever turns of phrase, showing no sign on the surface level of an aging director on the downslope. His cavalier and dismissive attitude towards long-established sexual mores is on full display here, reflecting his interest in showing people as they really lived– imperfect, self-serving, and unabashedly sexual. Despite her age, Scarlett readily acknowledges having had sexual encounters with many of her prior male suitors– an admission that would have been met back in that day with many a pearl clutched. There’s also the subplot that circles around MacNamara’s affair with his secretary, a relationship that Wilder portrays without an ounce of judgment or moralizing. This aspect of MacNamara’s character is simply that– one of the many traits that constitute his individuality. Wilder’s treatment of this subject matter in ONE, TWO, THREE isn’t necessarily an endorsement, but it is regarded by him as a relatively minor indiscretion, with little impact to the narrative at hand. This aspect of the film places ONE, TWO, THREE firmly within the tradition of THE SEVEN YEAR ITCH (1955) and THE APARTMENT, all of them casual explorations of marital infidelity that anticipate the forthcoming Free Love era– albeit from the limited, privileged viewpoint of a chauvinistic patriarchy. ONE, TWO, THREE finds Wilder returning to Berlin to discover how the city has built itself back up from the desolate ruins previously seen in A FOREIGN AFFAIR (1948). The landscape still bears the scars of World War 2, with the fallout from Nazi atrocities creating a crisis of conscience and class that has quite literally split the city in two. For the purposes of Wilder’s narrative, these two competing sectors stand at ideological extremes– the Russian-controlled East resembles A FOREIGN AFFAIR’s desolate ruins and empty streets, and is lit very much in the style of a moody noir picture, while the capitalist West is a brightly-lit land caught up in the hectic bustle of runaway modernization. This dichotomy of setting provides a natural conduit for Wilder’s further explorations of class and status– the film’s central conflict stems from a bourgeois socialite falling love with a working-class socialist. It’s an unholy union that causes no shortage of headaches for MacNamara, who’s been unwittingly thrust into the middle between them. And speaking of unholy unions: ONE, TWO, THREE also depicts how the conquered Nazi foot soldiers have reintegrated themselves back into civilian life. Some, like the Coca-Cola employee who can’t quite kick the habit of clicking his boots when given orders, are painted as neutered buffoons robbed of any lingering malice or power. This depiction is similar to the treatment they received in A FOREIGN AFFAIR, and is perhaps indicative of Wilder working out his aggressions against the regime that exterminated his family during the Holocaust. Like the heroes found in Wilder’s previous works, ONE, TWO, THREE’s protagonist is a man who identifies himself primarily through his occupation. Every single action that MacNamara takes is calculated towards a higher rung on the corporate ladder, even if it means such a move comes at the expense of his own family. He’s a company man through and through, proud to be working for a major corporation like Coca-Cola– even to the point that he sees the brand as a shining beacon of American democracy and capitalism, and his job within that brand as the person blessed with the righteous task of illuminating the dark corners of the world with that light. This conceit also allows for the natural inclusion of uniforms as visual signifiers of identity. ONE, TWO, THREE sees Wilder exploring this idea through the prism of occupation, like the utilitarian garb donned by soldiers and chauffeurs, as well as the prism of class, as seen in the sequence when MacNamara forces the blue-collar Otto to dress up in the starched regalia of the European aristocracy in order to impress Scarlett’s father. ONE, TWO, THREE is an underrated film in Wilder’s canon– a breathless exercise in sheer comedic speed that was ultimately sabotaged by the times in which it was released. 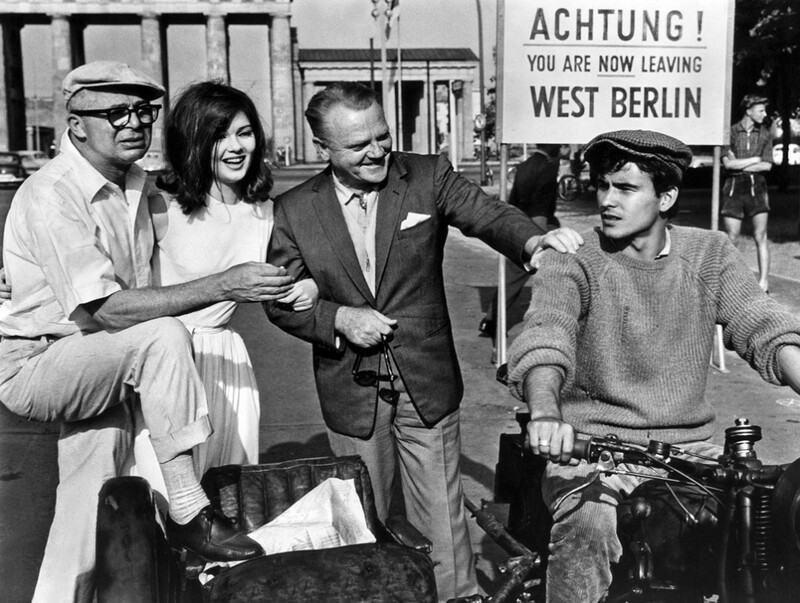 The film bombed at the box office despite positive reviews, owing in part to the national mood following the construction of the Berlin Wall and the dramatic increase in Cold War tensions that such a move engendered. It was eventually re-released in French and German markets in the mid 1980’s to a much warmer audience reception, but the damage was already done. ONE, TWO, THREE’s failure to launch raised the idea that perhaps Wilder’s best days were behind him. With the Cold War now (mostly) relegated to the history books, there is an opportunity for modern audiences to appreciate ONE, TWO, THREE for what it is: a fizzy comic confection with a dash of misanthropic bite and genuine historical insight. It may not be a cornerstone work for Mr. Wilder, but ONE, TWO, THREE further cements his legacy as the director that was intimately attuned to the sociological impact of the twentieth century’s world events and the best-equipped to reflect back the absurdity of it all. ONE, TWO, THREE is currently available on high definition DVD via MGM. Via Wikipedia: “BeWildered Berlin”. Time. December 8, 1961. Retrieved 2011-09-11.